President Armen Sarkissian, who is in Artsakh on a two-day working visit, together with the President of Artsakh Bako Sahakian and Prelate of Artsakh Diocese Pargev Archbishop Martirossian participated today at the unveiling of the monument dedicated to the 17 residents of Maghavouz village in Martakert region who gave their lives in the Artsakh War. 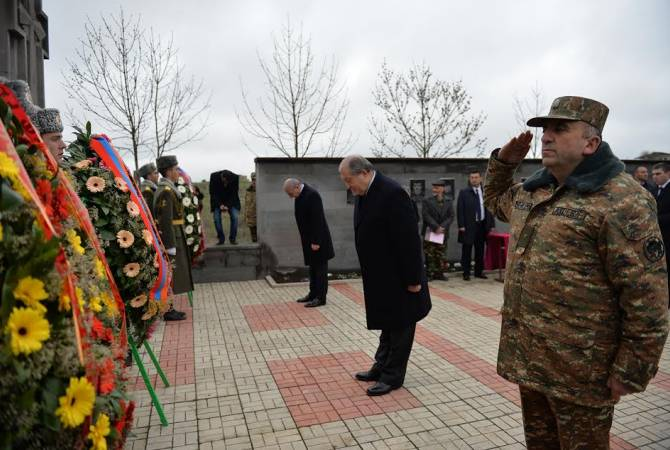 Presidents Armen Sarkissian and Bako Sahakian laid a wreath at the monument and paid tribute to the memory of the residents of Maghavouz killed in the Artsakh and Great Patriotic Wars. For courage demonstrated during the April, 2016 war, President Bako Sahakian awarded a group of Maghavouz residents with Artsakh state honors. Afterwards, the Presidents of two Armenian states conversed with the residents of the village present at the event.